Connected Health » Featured, Fitness Gadgets, Health Gadgets » Tinke: The next must-have gadget in health and wellness tracking? 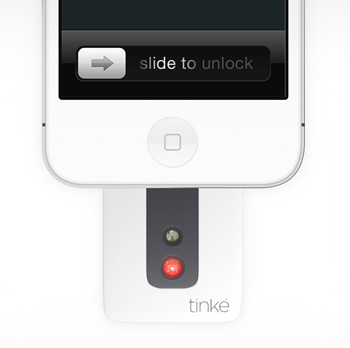 Tinke: The next must-have gadget in health and wellness tracking? Argh we know what you’re thinking not ANOTHER cute little health and wellness tracker that’ll tell me exactly the same stats as the one before it and the one before that and the one… But no, Tinke is a little bit different, it’s a health tracking gadget, yep, but it’s not just about tracking your steps or helping you lose weight, it’s a total body monitoring solution and we think it might just be the next must-have gadget for those who want to track and monitor what they’re up to in a more meaningful way. The Tinke is able to track your heart rate, heart rate variability, respiratory rate and blood oxygen level with the touch of your fingertip. On Tinke’s website the team explains that all of that data combined provides you with a better understanding of your cardiorespiratory wellness and apparently that’s something that’s often neglected by other services and gadgets in favour of much more trivial metrics. To be able to obtain the data you simply hold your finger on the little TInke and without a battery or extra screen it’ll do all of the work. You then plug it directly into the port on your phone and can monitor, track and share the data online as much as you wish. There are plenty of gadgets on the market for if you’re only interested in being more active (like the Fitbit Zip) or smashing those fitness goals (like the Nike+ FuelBand), but if you have underlying health issues or you’re more interested in deeper metrics about the way your heart is working, then Tinke looks like it’s going to be a great solution.